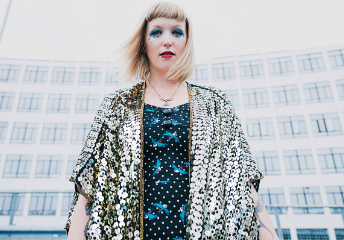 Ahead of a one-off date at Brighton's Hope & Ruin, Bristol based multi-instrumentalist producer and visual artist She Makes War has released her new single Devastate Me, taken from her upcoming album Brace For Impact. "It's about photography as a reflex, the way people overshare online and how when we die our online profiles just stay there. "The internet is amazing - I've built my career using it, but it can be so awful." Simultaneously scintillating and scathing, the track is an infectious dose of punk-infused pop with a conscious message. The track is taken from her upcoming album, Brace For Impact, the follow up to 2016"s acclaimed, Direction Of Travel. On her new record, up steps a femme fatale who slays with words of passion over ruthless action. Embarking upon a voyage of self-discovery, her songs stay close to hand-crafted journals packed with stickers and photographs, sparks of lyrical imagination and inspirational notes, simultaneously slaying with killer riffs. "After finding myself in a happy relationship after a long period of sadness, this record enabled me to ruminate and find ways of creating beauty where there was once pain." "I'm the strongest I"ve ever been because of all I've been through." The album naming decision was as dramatic as the music itself, coming after she broke her foot moments before supporting The Brian Jonestown Massacre. With barely enough time to visit A&E, a face full of glitter and steely resolve, she performed a slew of summer festival sets and a BBC 6Music Marc Riley session sporting a fetching knee crutch. "Having my mobility stolen from me was exhausting and depressing. I'd come up with the album title while driving on tour, daydreaming about what it must be like to be in a high-speed car crash", she recalls. "After struggling through the summer with that phrase in my mind, then finding it written in the venue toilets at the end of a tour in Brighton, it just had to be the album title. It couldn't have been more apt." A fiercely devoted, independent DIY force, She Makes War has crafted her success from a close relationship with fans, placing importance on her music's physical form and an emphasis on the live experience. She Makes War's new album, Brace For Impact, is out on 28th September. Catch her live at the Hope & Ruin, Brighton, on 27th October 2018. CLICK HERE for more info.